A roller sleeve or cover is commonly thought of as something found in a painter’s toolbox rather than a concrete contractor’s. However, rolling sealants and colors onto (and into) concrete has become an increasingly popular option indecorative concrete applications. It’s sometimes said that anyone can roll paint. However, professional painters argue that’s not true. It takes skill to apply paint to a surface in such a way that it looks as though it was there all along. The same is true for roller-applied coatings on concrete. Perhaps anyone can do it, but it takes skill and experience to do it right. There are different methods of use, all of which affect the desired finished product. On top of that, there are different kinds of rollers. You need to choose the right one to excecute your decorative concrete job perfectly. In decorative concrete, rollers are most commonly used to apply coatings and sealers, says Chris Sullivan, vice president of sales and marketing with ChemSystems Inc. They can also be used for applying some nonreactive stain and dye products. One important distinguishing feature of each roller is the “nap,” the length of its fibers. Different naps are recommended for applying different materials. Still, despite all their potential issues, rollers are often preferable to sprayers. Ralston has also used rollers to embed thin overlay stamps in custom jobs. To apply stamps he recently created with seaweed, he used rollers to apply enough light pressure to embed a shadow print on the concrete floor of an oceanfront home. Made from a special blend of high-capacity, nonshedding European woven fabric. 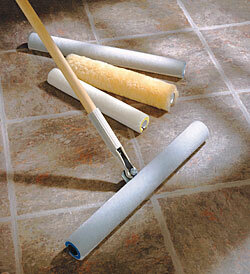 Picks up more product than other synthetic roller covers. Distributes material more smoothly and evenly over a larger surface area than other roller covers. Available in 1/4-inch, 3/8-inch and 9/16-inch naps. Widths range from 4 inches to 18 inches. Perfect for use with floor finishes, sealers, paints, stains, epoxies and waxes. Provide a streak-free and lint-free application on hardwood, concrete, vinyl, tile and terrazzo surfaces. Available in 9-inch or 18-inch sizes. Waterborne and solvent-modified finishes and waxes are applied in thin coats or thicker-mil thicknesses depending on the applicator used. The heavyweight tool is used to apply a uniform thin coating. The lightweight tool applies less pressure for a thicker coating. Available made from lambswool, woven fabric or Nylfoam. Sizes range from 12-inch to 30-inch widths. Provides the industry’s most lint-free finish. Made of high-density, woven Dralon fabric. Designed for easy rolling and provides a high-quality finish. Available in widths ranging from 3 inches to 18 inches. Nap depths range from 3/8-inch to 3/4-inch. Great pickup, gliding flow and impeccable release. Resists matting and maintains bounce for even application. Excellent control of film thickness. Doesn’t pick up what has already been released, eliminating drag problems. Available in 4-inch, 9-inch and 18-inch lengths. The covers offer the smoothest, lint-free finish with paints, enamels and varnishes. Dense fibers reduce dripping and spatter for neater results. A top roller is good for putting down epoxies. Available in 4-inch, 7-inch, 9-inch, 14-inch and 18-inch lengths. Nap heights range from 3/16-inch to 3/4-inch.